Owner bred by K. Abdulla and trained by J. Tree. Won 1 from 3 at 2yo - 2nd on 6f debut July 7th, won 6f maiden August 18th and unplaced in 6f Group 1 Prix Salamandre. At 3yo won 6f Group 1 July Cup, 6f Group 3 Cork & Orrery, 7f Group 3 Free Handicap and placed in the 2000 Guineas. 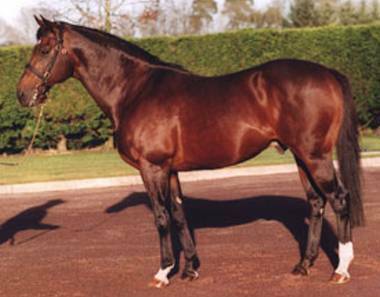 To stud in 1990 and has proved a top class sire, particularly since being bought to stand at Coolmore in Ireland/Australia after spending 1996 in Japan. Has produced a variety of recent Group 1 winners ranging from Derby winner North Light, July Cup winner Mozart and milers like Rock Of Gibraltar, Banks Hill & Clodovil. Died in 2005. Good and consistent record with British raced 2yos with between 30% to 45% winners to runners record and a relatively high number of better class runners. Wins tend to be from June onwards at all distances from 5f to 8f. JUSTY May 27 NMKT 6 GSS 5 M NR- . SIMPLY PERFECT May 28 NMKT 5 GS 4 M NR- . ABBY ROAD 1 Jun 19 WWCK 5 GFF 5 Mf 0.66 2-7 63 T3 -2Hf, Prog-2f, Ld-1.5, POn, Ld too Long? ABBY ROAD 3 Jul 22 RIPN 5 GF 4 MF 2.5 1-8 69 . REEBAL 3 Jul 22 NMKJ 6 GF 4 M 4.5 5-7 33 B . MIGHTY MISSOURI 2 Jul 29 SALS 6 GF 4 M 12 6-7 35 . SIMPLY PERFECT 4 Jul 29 ASCT 6 GFG 1 G3f 5.5 3-10 80 . DUKE OF MARMALADE 3 Aug 2 GDWD 7 GF 1 Gp2 2.75 2-10 94 . SUPPOSE 2 Aug 2 GDWD 6 GF 2 Mf 14 5-12 57 . DANEBURY HILL 3 Aug 4 GDWD 6 GF 1 Gp2 7 5-7 77 . MIGHTY MISSOURI 3 Aug 4 NMKJ 6 GFG 5 M 12 8-9 39 . CAPTAIN JACKSPARRA 1 Aug 9 PFCT 6 GF 4 M 4 4-15 35 . DENBERA DANCER 1 Aug 9 PFCT 6 GF 4 M 6 5-15 31 . ABBY ROAD 4 Aug 19 NWBY 5.1 GSS 1 Lsf 4.5 1-10 78 . CAPTAIN JACKSPARRA 2 Aug 21 AYR 7.2 GSG 4 M 1.63 3-7 62 . DANEBURY HILL 4 Sep 26 SDWN 7.1 GGS 1 Gp3 12 3-8 77 T .
CAPTAIN JACKSPARRA 3 Sep 4 NEWC 6 S 5 M 7 6-11 22 . ABBY ROAD 5 Sep 8 YORK 5 GGS 1 Gp2 7.5 6-9 74 . SIMPLY PERFECT 6 Sep 9 YORK 8 GGF 1 G3f 4 1-9 80 . SUGAR RAY 1 Sep 15 NWBY 7 G 4 M 10 7-12 57 . CINQUANTE CINQ 1 Sep 16 NWBY 6 G 4 M 20 6-16 47 . CAPE JASMINE 2 Sep 22 HYDK 6 GGS 5 Mf 40 15-17 4 . ABIDE WITH ME 4 Sep 23 ASCT 8 GSS 1 G2c 12 6-7 58 . ADMIRALOFTHEFLEET 4 Sep 23 ASCT 8 GSS 1 G2c 5.5 1-7 95 . SIMPLY PERFECT 7 Sep 23 ASCT 8 GSS 1 G1f 2.75 1-8 85 . DANEHILL KIKIN 1 Sep 28 NMKT 6 G 4 Mf 6 7-10 37 . SIR DUKE 1 Sep 28 NMKT 8 G 4 Mcg 33 15-15 0 . DANEBURY HILL 5 Sep 29 NMKT 7 S 1 G3c 8 10-10 33 T .
REEBAL 5 Oct 2 WDSR 5 S 4 Nur 6 3-8 64 B . CLOUDED LEOPARD Oct 3 LEIC 7 S 5 Mf NR- . ABBY ROAD 6 Oct 7 ASCT 5 GS 1 Gp3 10 8-10 54 . REEBAL 6 Oct 13 NMKT 6 GS 4 Nur 6.5 11-12 45 B .
HOLY ROMAN EMPORER 7 Oct 14 NMKT 7 GS 1 Gp1 3 2-15 103 . QUEEN OF FRANCE 3 Oct 14 NMKT 7 GS 1 G2f 16 10-14 58 . DANEHILL KIKIN 2 Oct 16 WDSR 6 GSS 5 M 10 5-10 38 . CLOUDED LEOPARD 1 Oct 21 LNGA 7 STD 5 Mf 14 3-8 56 . VENERABLE 1 Oct 28 NMKT 7 S 5 Mcg 40 13-19 35 . REEBAL 7 Nov 4 WDSR 6 GS 4 Nur 16 4-14 58 B .